It’s time to change things up for Story, here is wishing him a brilliant retirement! I wasn’t in the market for a puppy. Not really, but if you are a dog person you kind of always are to be honest. Franny was around five years old or so, Ocean almost three, we were hitting our stride. Franny was trail running with Spore every day, Ocean and I competing in herding, agility and freestyle almost every weekend and more. 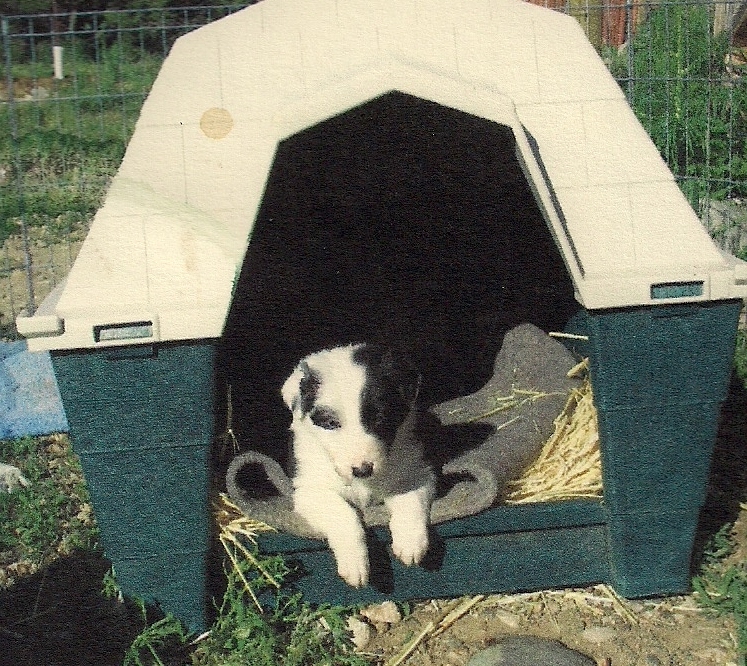 And then I saw an article in the paper, “Quality Border Collie Pups”. I had never seen them listed that way, and was curious so I called. The call led to a four hour visit, the visit led to an additional phone call, and a few days later we met half way and brought Story home. We were the first non-ranch home to be approved for one of her puppies. I promised to give him a rock star life and to use his working abilities, he would be more than a pet. 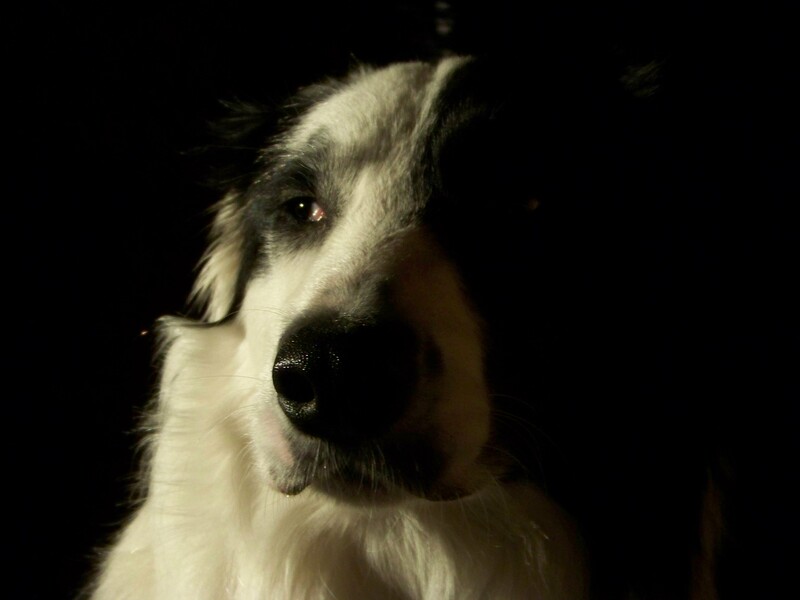 He came from the Ross line of border collies, a Scottish line, and a fine one I might add. Not a single dam thing wrong with these dogs. Solid in every which way. A gift. His litter name was ‘Jig’, because his markings looked like a jigsaw puzzle. The kids named him Story B. Jones. It was a combination of a story book series that my children were reading at the time, and their love of books. To me it was perfectly pimpish, I loved it. He was my first dog that was strong, out going, athletic, super social, and 100% comfortable in his own skin. Nothing to modify, life was good, so we had unlimited time to train, train to my hearts content, and it turns out Story’s. I had never had a solid dog of my own, solid on every level. Rock On! So we went to town doing everything, literally. My immediate goal was owner trained Service Dog. I was working through some limiting health issues at the time, so this was an awesome fit. The cool thing about this journey was that I did everything with him, exposed him to more than my other dogs had ever seen, and involved myself in several sports to keep him flexible, both mentally and physically. After 18 months he pretty much let me know Service Dog worked sucked for him, he was way to social, and wanted work that was more explosive and dynamic. I am so glad I was working in other areas at the same time as it let us continue right along with training without missing a step. Agility was super fun with Story. He went from polite and accurate to running like a steam train. Power, force, 100% each and every time! You could feel his energy on course, I loved it, every minute. Herding, well he did it all without me doing anything. He was amazing and breath taking to watch on stock. Balanced, settled, great distance, and powerful. He never had problems with green sheep or rams. He worked them all the same, and they all listened. This is something I wish we had put more time into. Freestyle, this was our thing. Story and I came together and really blossomed with freestyle training. The creativity, the complex sequences, and the focus. 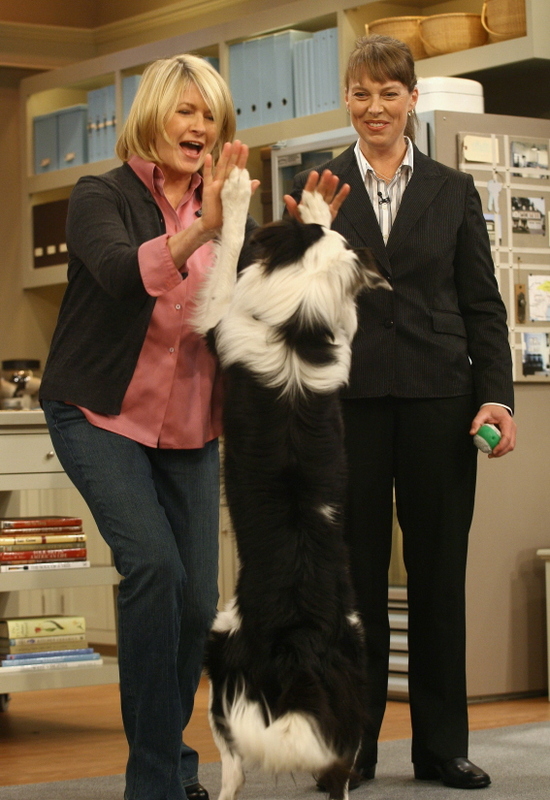 He was honored, at 17 months of age, with a guest appearance on the Martha Stewart Show. It still makes me smile that at his youthful age he handled that whole experience in stride, like he was born for it. He made me smile through that whole journey! And then along came treibball. This has been the only sport Story was not initially excited about. He was disgusted that I would actually ask him to put his face on the ball. I had to slow down with this sport and wait for him, make it worth his while. And now, two years later, he is an awesome player, a World Pusher with the World Treibball League! Story’s image has graced newspaper and magazine articles, and has been part of our advertising campaign for the Scent Project. 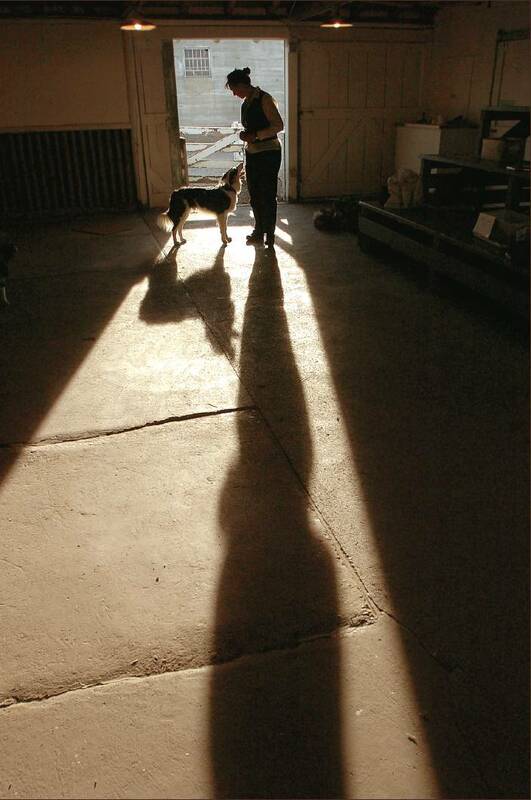 This image is one of my favorites from early in our freestyle training, and appeared in the Bozeman Chronicle. 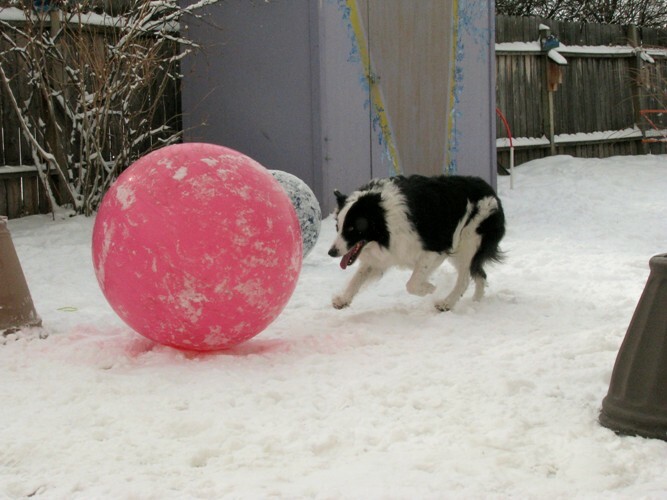 Story has worked with hundreds of our clients dogs, from puppies and adolescents, to dogs that didn’t trust other dogs, or had reactivity issues. He has such a lovely way of greeting dogs and knowing when he can move forward, and when he should give more space. Since he has not an ounce of malice intent, he seemed to be able to put most dogs at ease, some actually learned to play again. But about two weeks ago he let me know he was done with this type of work. He looked out the car door at the dog we were going to be working with, and I swear I heard him say to the other dog, “sorry, you’re on your own dude”. He crawled into the back seat and that is all the information I needed to have. Retirement, lounging, hiking, treibball, a demo here and there, it made me smile, it was time. He has had an amazing career, possibly more to come but in a much less stressful way. We are changing gears! So here is to my big, brilliant, and beautiful boy, Story. You are a gift each and every day. Love to you, all the way around! click on a photo and then follow the arrows! Really awesome how much Story has done for other dogs, how many activities he has been involved in. What an awesome dog! Robin he is, and every day I know he is a gift. adjust the volume is the best hing I have heard in a long time. I love it…. 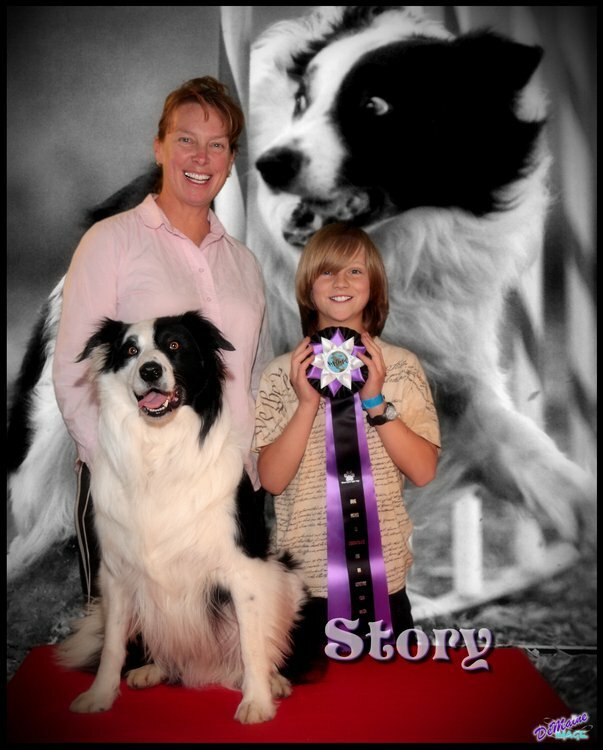 Me and my JT(our BC) loved your story. What a beautiful life our beloved pets live and give us in return. Thanks for writing it. Story is one cool, cool dog 🙂 Congratulations on all that you two have accomplished and enjoy this new leg of your journey together! Kim, thanks! I am looking forward to the journey ahead. We are both looking forward to it! What an AMAZING dog and I loved your blog! Happy retirement Story! But Nancy, you forgot to mention how he has captured the hearts of many female dogs, he is a dreamy movie star in Bailey’s eyes!